Ecological Economics from the Ground Up takes a unique and much-needed bottom-up approach to teaching ecological economics and political ecology, using case studies that focus on a wide range of internationally relevant topics, to teach the principles, concepts, methods and tools of these fields, which are seen as increasingly important in the context of the current triple social, economic and environmental crisis. This book provides learning materials which are grounded in the experience of Civil Society Organisations (CSOs), with case studies chosen by CSOs and developed collaboratively with leading ecological economists. The case studies come from Europe, India, Latin America, and Africa, and are presented thematically along three lines: 1) social metabolism and accounting methods, 2) institutions and participation, and 3) valuation and environmental policy tools. Core tools, concepts and glossary terms are embedded in topics chosen as a matter of urgency by activist organizations, related to mining and fossil fuel extraction, integrated transport infrastructure development, deforestation and agro-fuel production, sustainable tourism, waste management, wetlands and water management, payments for ecosystem services, natural disasters and hazards, and corporate accountability. 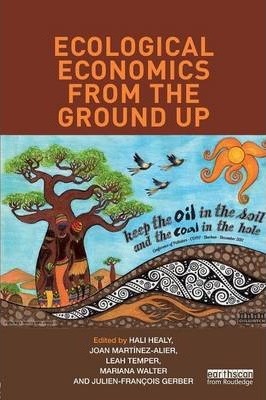 Ecological Economics from the Ground Up has been designed to be an accessible learning aid for students of the sustainability sciences and for those CSOs that have recognised the value that ecological economics and political ecology tools and methods hold for their research and advocacy work. 'In this pioneering example of what the European Commission calls `co-operative research', the authors have genuinely succeeded in articulating a diversity of often-conflicting disciplinary and societal perspectives around pressing social and environmental policy challenges around the world. [...] A coherent set of central ideas and approaches are explored through an impressive array of empirical case studies. These span a wide range of contrasting industrial sectors and socio-ecological contexts, extending across both northern and southern global settings. The emphasis throughout is on international, environmental and institutional interconnections. The breadth of analysis also extends beyond the often-narrow disciplinary domains, to encompass often-neglected dimensions of culture and power, as well as economic, biophysical and technological dynamics. Hali Healy is a PhD candidate in the Department of Geography at King's College, London, United Kingdom. She also coordinates an online course in Ecological Economics and Political Ecology for Environmental Justice Organizations. Joan Martinez-Alier is Professor of Economics and Economic History at the Universitat Autonoma de Barcelona, Spain. He is also a founding member and past president of the International Society for Ecological Economics. Leah Temper is a researcher in Environmental History and Ecological Economics at the Universitat Autonoma de Barcelona, Spain, and a freelance environmental journalist and video artist. Mariana Walter is a researcher and PhD candidate at ICTA, Universitat Autonoma de Barcelona, Spain. Her thesis addresses mining conflicts in Latin America. Julien-Francois Gerber is Visiting Fellow at the Department of Economics, Harvard University, USA. He is interested in plantation studies, agrarian change, political ecology, and institutional and ecological economics.